A fairlead is a device to guide a line, rope or cable around an object, out of the way or to stop it from moving laterally. 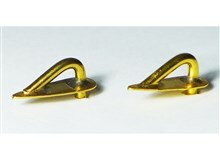 Typically a fairlead will be a ring or hook. The fairlead may be a separate piece of hardware, or it could be a hole in the structure. The central bollards, when they exist, have the function of avoiding excessive wear of the mooring lines.